HDTV Supplys WolfPack 14x16 HDMI Matrix Switcher with a Color Touchscreen is a pre-configured integrated HDMI video and HDMI audio modular HDMI matrix router. The 18x18 chassis back plane allows HDMI technologies to be converted and switched eliminating external converters and it allows any input to be routed to any output, or the same input to be routed to all outputs, or any combination. The core of the 14x16 HDMI Matrix Router consists of an 18x18 Modular Matrix chassis and its highly configurable backplane that supports 18 input cards and 18 output cards. 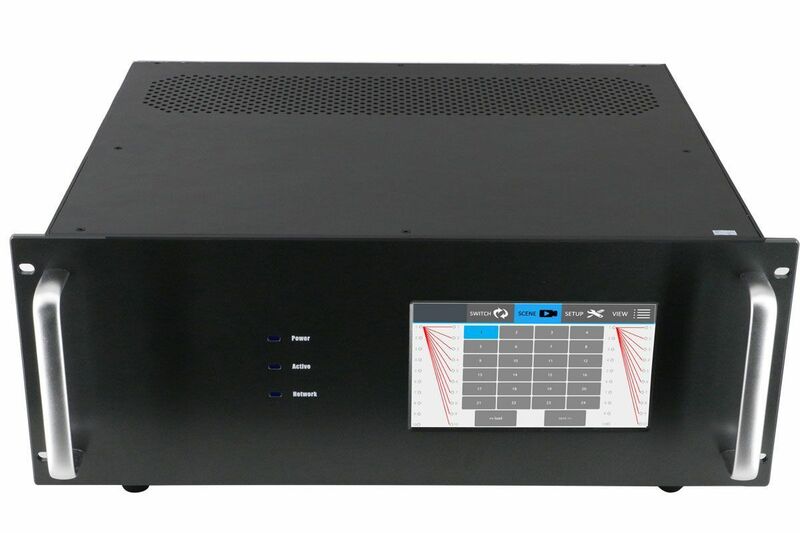 The 14x16 HDMI Matrix Router is also 4K @ 30 Hz at 4:2:0 compliant. You can control the 14x16 HDMI Matrix Switcher Control via an iPad & Android App, Web Browser (WEB GUI), RS232 & 7" Touch Screen. The matrix does not have IR nor a remote control but can be controlled with its iOS and Android app. The 14x16 HDMI Matrix Switcher with a Touchscreen is 4K at 30 Hz 4:2:0 compliant and has 1-port slide in cards and is very reliable as in the unlikely even there is a loss of signal you just replace the card with a spare you have purchased or order another from us. The complete matrix doesn't have to be sent to us for a repair. By having 1-port slide in cards the matrix is very reliable as in the unlikely even there is a loss of signal you just replace the card with a spare you have purchased or order another from us. The complete matrix doesn′t have to be sent to us for a repair. The WolfPack 4K 14x16 HDMI Matrix Switcher with a Touchscreen manages HDMI input signals for the inputs and outputs. 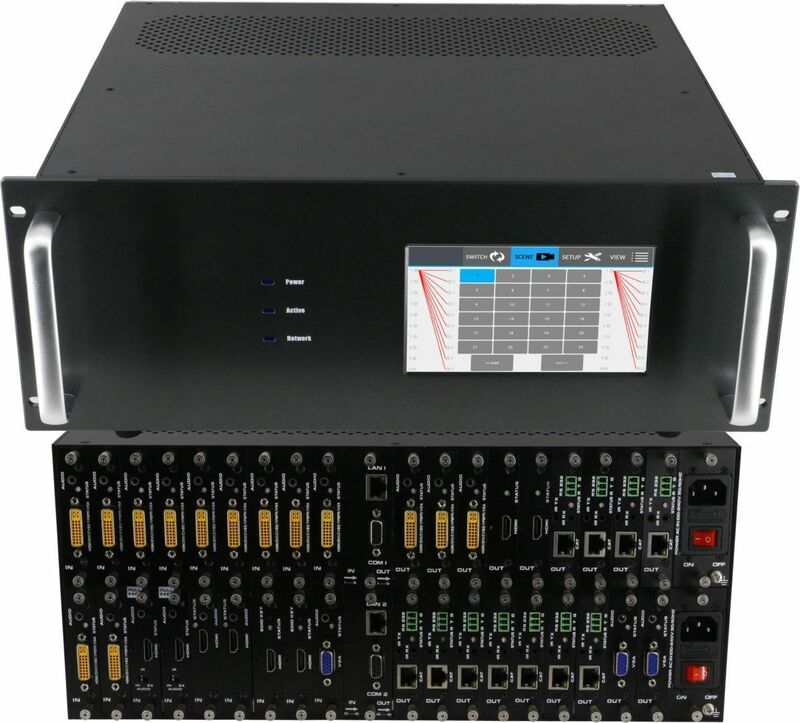 This 4K 14x16 HDMI Matrix Switcher with a Touchscreen support long haul transmissions, maintains power reliability in the event of failure and offer the best flexible solutions for an AV system deployment. Our 14x16 HDMI Matrix Switcher with a Touchscreen also can support high-resolution HDMI sources routed to HDMI displays, monitors, projectors, or audio receivers, etc. The EDID can be selected between seven different modes or copied from the attached displays. The heart of the HDMI inputs is the WolfPack chassis backplane which allows customization of the configuration for input and output cards to match every need of the system and application. The matrix support hot-plugs and you can change the cards while the equipment are still working. EDID Explained: The 4K 14x16 HDMI Matrix Switcher with a Touchscreen EDID provides for optimal source-to-screen performance. EDID will optimize the video card output for the capabilities of the end display. The EDID ghost unit enables the copying, emulating, cloning, and "learning" of EDID data from a display. Our EDID Emulator and repeater comes with predefined presets, user programmable banks, Sink EDID sniffing bank and more. Our EDID Emulator ensures proper operation, for the best performing HDMI audio and video signal between any source and display Resolves loss of video, intermittent (flashing) video, snow, or color-space (purple or red) issues. Why not buy buy this 4K 14x16 HDMI Matrix Switcher with a Touchscreen today? 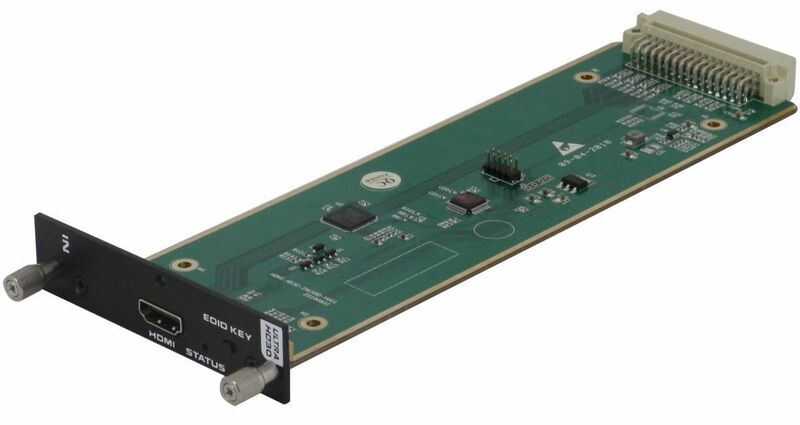 Supports EDID Management: Ensure that even the most difficult display can receive audio and video with eight programmable memory presets loadable to any source connected to the matrix. Includes a Back Up Power Supply: In the unlikely event the main power supply becomes inoperable, the built in redundant power supply will seamlessly take over the matrices power needs. HDTV Supply has successfully installed our WolfPack, WolfPackLite and our other HDMI Matrix Switchers in Sports Bars, Restaurants, Bowling Alleys, Fitness Centers, Malls, Places of Worship, Data Centers, Gaming Rooms, Nail Salons, County Clubs, Casinos, Factories, Conference Rooms, Schools, Home Theaters or many other installations requiring HDMI matrix switching. The reason, we are told by the users, is the number of features we offer compared to other companies they looked at. These modular HDMI matrix switchers can usually be integrated with many third party control systems using the RS232 port on the back of the matrix. ...and we have created a simple and very easy to use RS232 script to write your own drivers. EXAMPLE: If you want to switch input 8 to output 1, 8, 16, the RS232 command would be x1&8&16. and notice the command has a period (.) at the end of the string. The matrix even replies "OK" when the right command is received and "Failed" when receiving a wrong command. Here is the RS232 User Manual if you want to write your own drivers. Once you get our quote call a 3rd party control reseller or installer in your area and tell them "Here is the hardware I want to use, please give me a quote on writing the software and installing all of the hardware at my location." You usually can save $1,000s on larger systems. CAVEAT: We are not certified by any of the above 3rd party control systems companies nor have the necessary hardware to verify, troubleshoot and support the 3rd party writing of the code. We do warranty, though, that the RS232 script in the above RS232 Users Manual has and will work to control the matrix directly. Below is a video of the WolfPack 9x9 card cage model showing the fast switching speed and its features. The larger 18x18 card cage model will operate exactly the same but will allow more input and output cards. Q: How many Preset scenes can I Save and Recall? Q: What are the HDCP options? A: You can choose either to open or close the HDCP on the output card. A receiver that cannot support HDCP can also display the sources with HDCP. Q: What is you test procedure? Q: How do the 2-power supplies work with the matrix? Q: What are the dimensions of the chassis? Q: Do you have any tips in the unlikely event the unit fails? A: Turn it OFF and then disconnect the matrix from the AC power and all cables. Pull out each board from the rear and push back in. Plug all cables back in and turn it on. Q: How is HDBaseT technology different than others? A: Unlike other HD distribution technologies, HDBaseT is the only technology which enables CAT5/6/7 connectivity from 70 meters to 100 meters, depending upon the specific product, for uncompressed full HD multimedia content and up to 100 watts of charging power via a single cable. HDBaseT is optimized for video applications and can connect all HDBaseT enabled home entertainment devices. Also, HDBaseT technology has the capacity to deliver double the resolution available today to future 2K and 4K formats. Other existing solutions also require a specific cable and/or a new proprietary connector while HDBaseT utilizes the existing Ethernet infrastructure. Keep cables away from any equipment with an electromagnetic wave, e.g., mobile phone, microwave, radio equipment, fluorescent lamp, high voltage power lines, etc. CAT5/6 cables should not exceed 220 feet or (70m). Please adhere to the TIA/EIA568B standards when terminating network cables in the field. Shielded CAT5/6 with metal RJ-45 connectors are recommended to safeguard against random video flashes caused by electromagnetic interference (EMI). Free Android and iOS App: The IOS App for this WolfPack card cage matrix is in the Apple Application Store and when you SEARCH the key words "MCS" or "Matrix Control System" you can download and install it to your iPad or iPhone. Also from your iPad or iPhone click the following link...MCS-matrix control system to install it directly. For the Android App click the following link and download it. Go to Android App for control of this HDMI matrix switch.